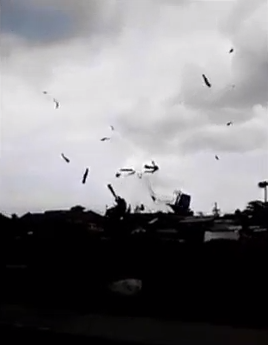 A "tornado" struck Cebu City on Tuesday afternoon, April 8, 2014. According to the Philippine Information Agency, the tornado was seen coming from the South Road Properties and passed by Barangays Mambaling, Tisa, Labangon and Alaska. "The tornado, shaped like a ball, darkened the skies in areas it passed over in Cebu City and caused power fluctuation at Senior Citizens Building," it said. Mambaling experienced worst damage as roofs were toppled down and electrical wirings were cut, Simeon Romarate, Director of Cebu City Disaster Risk Reduction Management Office, said. Via its official Twitter account, Visayan Electric Co. ‏said emergency crews were deployed to check the damage of the tornado in Mambaling area. The Philippine Star, meanwhile, reported that the tornado damaged 29 houses and a sports complex.